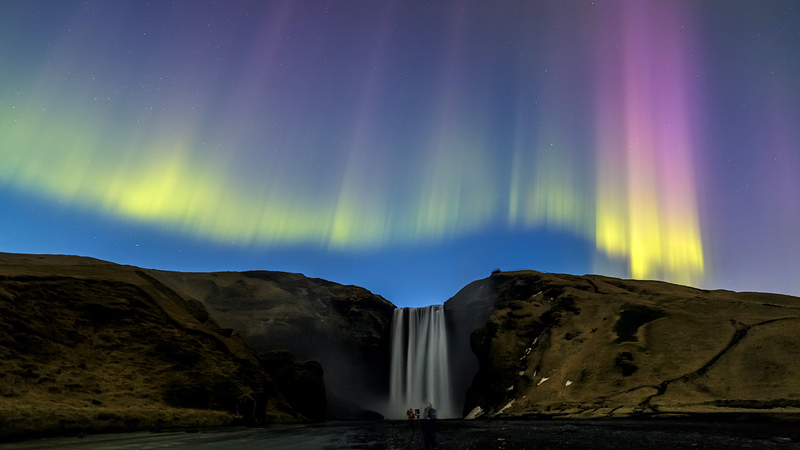 With its massive glaciers, volcanic landscapes, geothermal hot springs, and majestic waterfalls, Iceland is more than just an aurora hotspot – it’s pure magic. 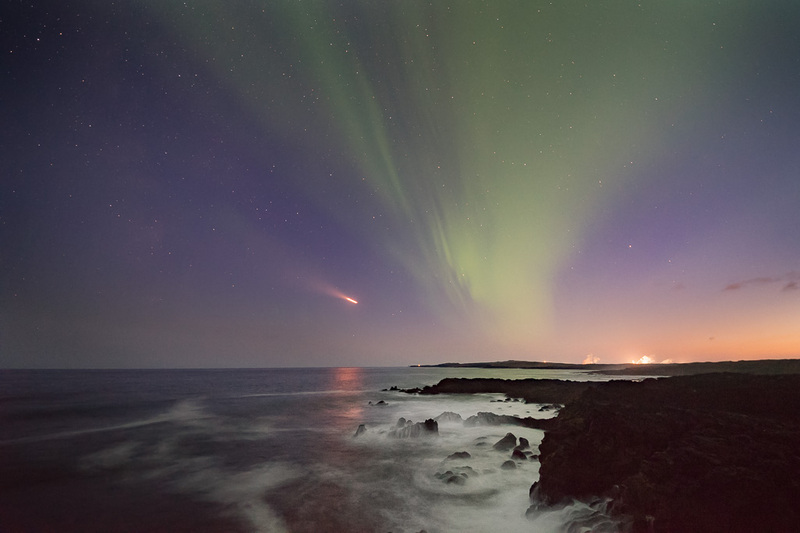 Here the aurora can be spotted from the comforts of thermal hot springs or the serenity of the untouched wilderness. 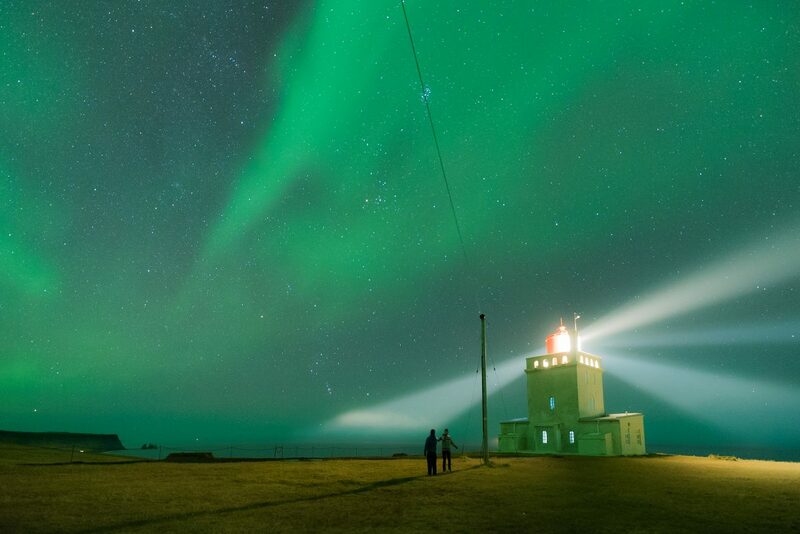 And if it comes to Northern Light photography, Iceland’s diverse landscape is just paradise. Maybe the best: Iceland is wide, wide open. Contrary to other destinations along the arctic circle, no trees will block your sight. The Aurora Borealis manifests itself in a huge ring above the Earth’s Geomagnetic North Pole which is referred to as the Auroral Oval. With a latitude between 63° and 66°North, Iceland couldn’t be located any better when it comes to Northern Light hunting. Clear and dark skies provided, you can catch a glimpse of green almost every night during September and Mid April. And several microclimates offer possibilities to find open spots in the clouds, even when the weather conditions are tricky. 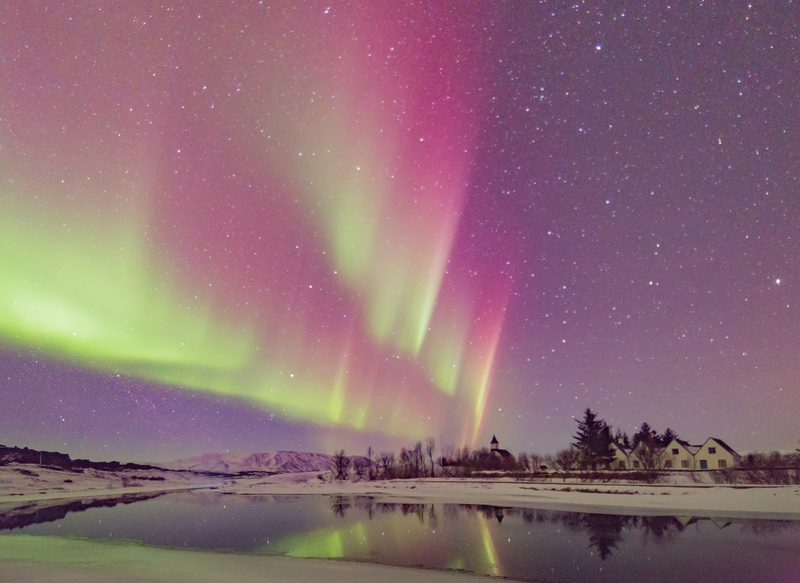 Getting around in Iceland is easy, and you might be able to observe the Northern Lights enlightening icebergs in the glacial lagoon, dancing above a sleeping volcano, and beautifully reflecting in Europe’s clearest lake in only one night. With a wide variety of low fare airlines, Iceland is easy to reach – even in the middle of the arctic winter. Both Icelandair and WOWair offer a stop-over free of charge, so it’s a great opportunity to extend your transatlantic journey for a couple of days in the pristine Arctic wilderness. 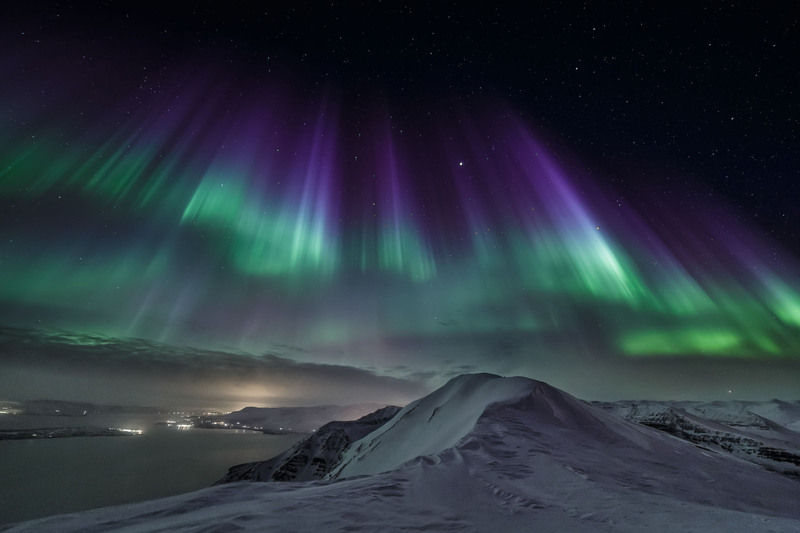 The best time to see the Northern Lights is along the Arctic Circle in winter, a time when the country is Nordically nipply or ball-freezingly cold. No problem for the thick-skinned Viking traveller, but not that convenient for those of us who run to a hot toddy and a roaring fire the second it drops below freezing. Luckily, Iceland’s climate is affected by the warm Gulf Stream, making it moderate despite its arctic location. And if you still struggle with the cold – there’s plenty of hot tubs to take a dip and watch the Aurora in all her glory. While an abundance of epic wildlife such as polar bears, mooses or wolfs is nice to observe from distance, no one wants to encounter a wild carnivore in the middle of nowhere during a northern lights hunt. No worries – with the cute and curious arctic fox being the only native mammal and one of the world’s lowest crime rates, Iceland is one of the safest spots for you Aurora adventure – at least if you don’t consider bathing in a boiling hot spring or falling in a glacier’s crevasse. Northern light hunting can be tricky, and especially if you’re a newbie to arctic weather conditions, the Northern Lights are best to be hunted with likeminded people and a professional local guide. 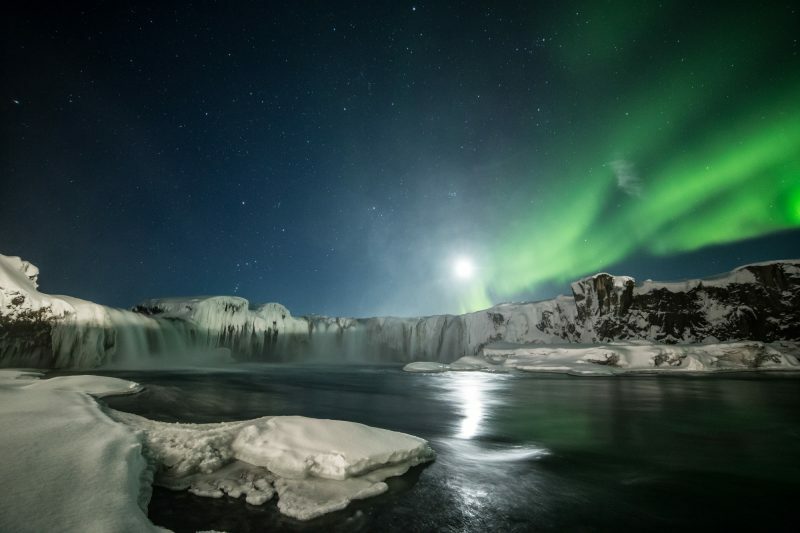 Comfi and luxurious minibus tours, relaxing Northern Light cruises or more adventurous super jeep tours or photo tours – or even a northern lights hunt on a snowmobile or horseback: Iceland has it all. Icebergs, hot springs and volcanoes dominate Iceland’s beautiful yet rugged landscape. On a guided coach tour, experience the hidden powers of the island including dramatic vistas of the notorious Eyjafjallajökull volcano and the breathtaking Glacial Lagoon. With several overnights in stunning rural locations, you’ll be perfectly situated to hunt for the magical Northern Lights.